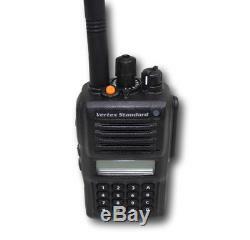 Vertex VX-P829 VXP829 VHF 136-174Mhz P25 Full Keypad Radio. 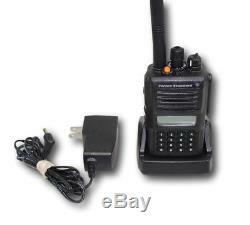 Vertex VHF radio, model number VX-P829-DO-5. These are 5 watt, 512 channel radios with a band split of 134-174 Mhz. Radios are in EXCELLENT condition and guaranteed fully operational. 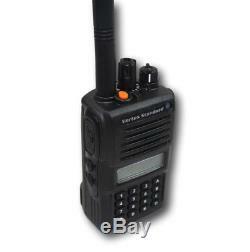 Includes APCO P25 interoperability combined with more advanced features not typically found in a radio of this size and are. Submersible up to 3ft for 30 min..
Unit comes complete with antenna, battery, belt clip and rapid charger. Frequency Range: VHF: 134-174 MHz. 512 Channel Capacity / 32 Groups (VX-820 Series with LCD). 16 Channel Capacity / 1 Group (VX-820 Series without LCD). 5 Watts Power Output (software selectable 5 / 2.5 / 1 / 0.25 Watts). No PF keys / No Display. 4 PF keys w/LCD Display. 12 key DTMF pad plus 4 PF keys w/LCD Display. Note: PF = Programmable Function. Large 12 Character Alphanumeric Display (Dot Matrix / 12 Characters + 7 Segments / 3 Characters). Digital ANI Encoder/Decoder Option : The VMDE-200. Encodes MDC1200, GE Star or DTMF ANI per channel / Decodes & Displays incoming IDs on radio! Super Small Size: 2.3 x 3.8 x 1.48 (57.5 x 96.5 x 37.5 mm). LOUD Audio Output: 700 mW audio output power! 2-Tone Encode / Multiple-2 Tone Decode. Program up to 10 Two-Tone pairs (1 per ch). DTMF ANI / DTMF Paging. Hi-Cap 2000 mAh Battery Option Hi Capacity FNB-V87LI Battery available. User Selectable Tone/User Set Mode. Submersible Waterproof External Microphone MH-65B7A (optional). Battery, Belt Clip & Antenna included. Wide / Narrow (12.5 / 20 / 25 KHz programmable per channel). 12.5/20/25 KHz Ch Spacing UHF 12.5/15/20/25/30 KHz Ch Spacing VHF. ARTS (Auto Range Transponder System). Remote Radio Stun/Kill//Revive (via 5-Tone signaling). Channel Scan, Priority Scan, Dual Watch, Follow-me Scan, Follow-me / DW and TA Scan. Compander (Wide and Narrow Band). AF Minimum Volume / Lone Worker. 7-Color LED Indicator Flash pattern and color can be set or 2-tone or 5-Tone Incoming Call Alert. Speed Dial (16-Key version only). VX-Trunk (VT-60F or VT60FS required). Weight only 310 grams w/FNB-V86L1, antenna and belt clip. We will only program up to 16 channels and do not program for trunking systems. The item "Vertex VX-P829 VXP829 VHF 136-174Mhz P25 Full Keypad Radio" is in sale since Thursday, July 27, 2017. This item is in the category "Business & Industrial\Facility Maintenance & Safety\Surveillance & Alarm Equipment\Two-Way Radios". The seller is "erac1" and is located in Lakewood, Colorado. This item can be shipped to United States, Canada, Australia.